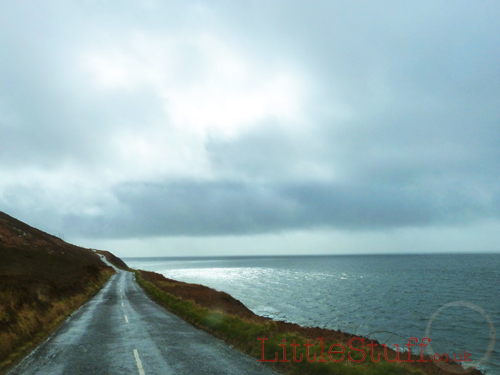 The final leg of our Scottish Road Trip was way over off the West Coast of Scotland, on to the Isle of Arran. The ferry itself is almost an hour’s crossing on a surprisingly big car ferry – the cost for us was over £60 each way, as it’s £31 for the car, plus £5 per person (there’s no benefit in a return price ticket unless you’re going back within 5 days; which is no use to holidaymakers!). We opted to catch the last ferry of the day to make the most of our journey down, so it was already 6 in the evening by the time we boarded – and 7p.m. when we landed in Brodick, excited and clutching the instructions to find Banlicken, our home for the next week. 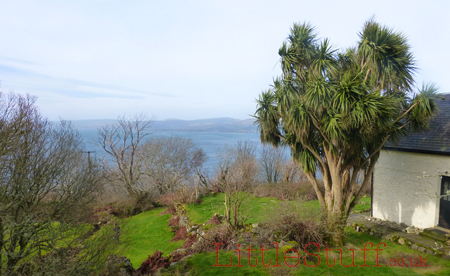 The instructions were clear, so with a fleeting glance at the delights of Brodick we headed inland to the ‘String Road’ which cuts across the middle of the island – we were headed to the coast on the the exact opposite north west corner of the island. By the time we’d left Brodick the sun had gone down, and we had no idea what countryside we were driving through. We knew when we reached the coast on the far side, obviously (the road simply runs along the beach so it was hard to miss! ), but I would suggest catching an earlier ferry – it would make finding the cottage a little less fraught even with the great instructions! Eventually we found the farmhouse we were looking for and followed the track up behind it – we knew the cottage had a 3/4 mile track which it is suggested you need a 4×4 for. We didn’t have a 4×4 with us, of course, but we trusted Dora the Caravelle to handle whatever came her way. The track is very bumpy, and you cannot take it at any speed, but it’s totally passable. It takes about ten minutes to climb up the hill to the top (through two gates and a ford with a waterfall), where Banlicken finally materialises in front of you. Bundling ourselves out of the car we had a quick explore and baggsied bedrooms. There was no question that the magnificently grown up double with its own staircase would be ours. At the other end of the house, up their own staircase, were three more rooms. Well – two rooms and a cupboard really. The twin room is spacious, and the bunk beds room was big enough for the two middle boys (though the older had to give up the top bunk as he made it creak every time he moved!). The third ‘bedroom’ is a teeny tiny space with a camp bed and a cupboard in it. Bear accepted that as the youngest it had to be hers (No.1 really didn’t want to share the twin room, and at 15 we could see his point about sharing with his 7yr old sister), but she wished to lodge her disproval with The Management (me). If you’re thinking of visiting Banlicken, do note that you’re a long way from a shop, so be sure to take your bare essentials, and probably take your first night’s meal in with you. There was no welcome pack waiting for us, so not even milk for a much-needed coffee. There’s a big Co op just off the ferry if you’re not already stocked up – you really do not want to have to do the track more than you have to; there is definitely no ‘popping to the shop’ from Banlicken! 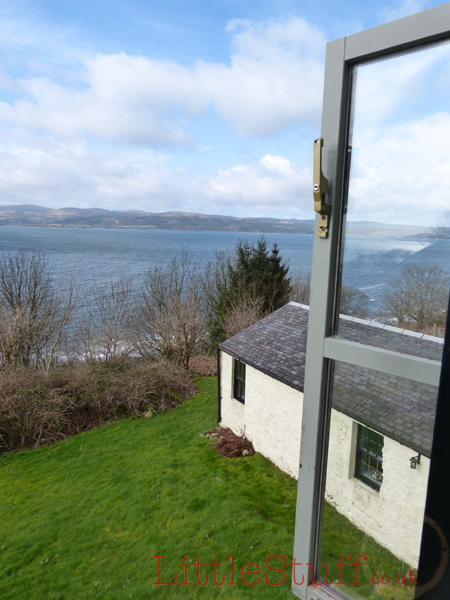 The view from our bedroom window, with the Byre next to the house. The following day dawned, and we could finally see where we were staying! 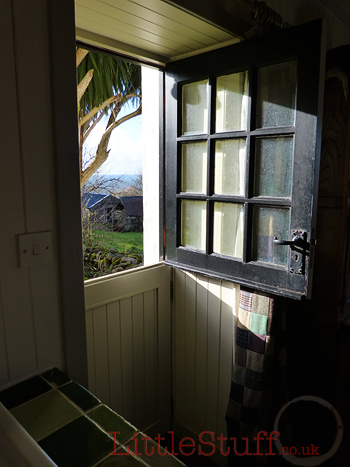 The views from the house are wonderful – Banlicken is right on the edge of the cliff top (which sounds over-dramatic, but if I say hill-that-runs-down-to-the-sea it’s not dramatic enough), and you can hear the sea from the kitchen. 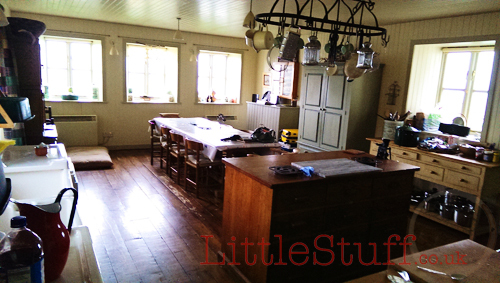 The kitchen diner is the gem of the house – it’s a huge room, full of light, a massive table and a brilliant kitchen. We spent most of our time in there, and can only imagine how beautiful it would be in the summer with all the windows open. 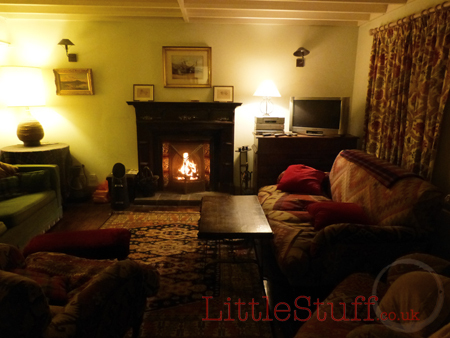 We loved this room – only lighting the fire to sit in the snug little sitting room once the children were in bed. The house wasn’t very warm at first – it took us a few days to work out the storage heater system, and the decor is very much for a summer beach house – lots of thin curtains or blinds at the windows. Amazing in the summer months, but staying there in March we could have done with some really thick curtains! However once we had worked out the settings on the heaters we were comfortable and warm. The extra en-suite bedroom – which we didn’t use – is in the byre, an entirely separate building (it sleeps five all in one room). If you’re not using the Byre, like us, that does limit you to the one family bathroom only, which has a huge roll top bath but no shower, making mornings rather busy in there; and NOT the time for enjoying the huge tub! The gardens have a rather neglected feel – admittedly we were there at the back end of winter, of course, and not seeing them at their best. But the collection of tumbledown old farm buildings are protected by large swathes of brambles, and if you’re a gardener then a wander around may make your fingers itch to start clearing more of the space. 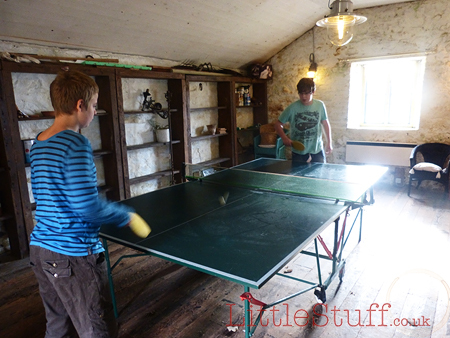 One of the old buildings has been re-roofed and provides the play barn which houses the table tennis table – it would be a great space to go on a wet afternoon if you had toddlers. The gardens themselves are worth an explore though – lots of levels with hidden nooks and quiet spots where you’ll come across a hammock just waiting for you to lie back and enjoy a summer’s breeze. I was rather envious – the bitter March wind wasn’t quite so welcoming! There is a small price for staying at Banlicken – you have to check on the water supply every other day. On a warm summer’s day this would be no chore – it’s a short sharp scramble up the hill behind the cottage to the tank, where you’re rewarded by breathtaking views. On a pretty filthy cold March day it’s not such a pleasant job, but luckily for us we brought along a teen who was up for the job. 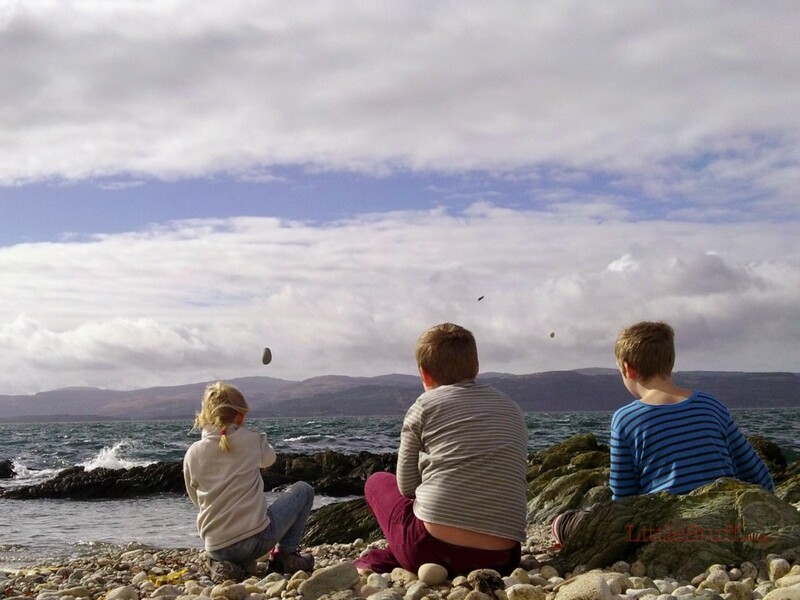 Arran itself was lovely – though not the destination for you if you’re looking for non-stop entertainment. This is much more your old-fashioned beach holiday, with a spot of walking thrown in – and maybe some board games on the wet days (the cottage is brilliantly equipped with games and books). It’s very much a holiday to step off the merry-go-round, and just spend some time… being. We spent an entire afternoon hunting for sea glass. Another we simply walked down the track from the cottage, beachcombing for driftwood, pretty shells and remarkable stones. Of course, we were there off-season, so not even Brodick Castle was open. Most of the shops were, but we exhausted Brodick’s browsing potential in one morning (our top shopping tip is the charity shop, next to the chip shop opposite the ferry – an absolute treasure trove of finds, we picked up a bucket of Hama Beads, a collection of books and a simply brilliant (and much needed) woolly hat). But lack of organised entertainment didn’t bother us in the least – we were happier exploring anyway. 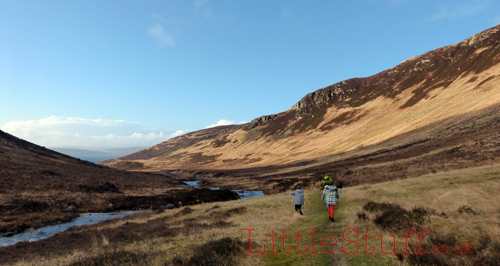 We did a fabulous walk from Whiting Bay to Glenashdale Falls, via an Iron Age fort and the Giants Graves (take the path signposted at the top of the waterfall to avoid the climb of the 300 steps to the cairns!). Another day we followed the North Glen Sannox walk, finally admitting defeat to the boggy ground in the foothills of the Carn Mor ridge. 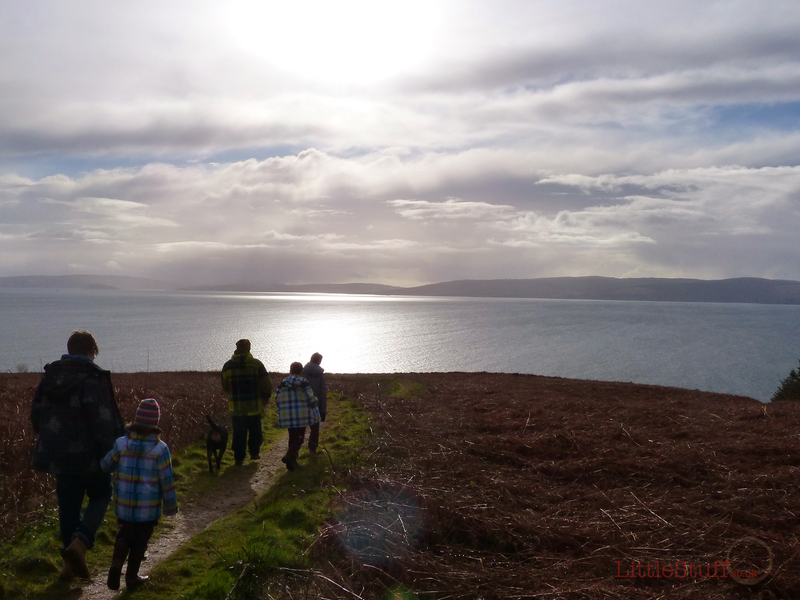 Our best walk was probably from Catacol Bay – one short saunter down the valley in the sunshine led us to return the next day for a really good 5 hour hike – in the sun, then rain, then snow, then sleet, then a huge thunderstorm cracking over our heads! Our final day was spectacular – the hills had a fresh shaking of snow on the peaks, but the sun came out to wash everything in spring sunshine as we walked through deepest pine forest to the amazing King’s Cave, where Robert the Bruce met the famous spider. We had a pretty special time staying at Banlicken. It was unfortunate that the day after we arrived the String Road across the middle was closed, making getting to the bigger villages on the far side of the island a much longer expedition (N.B if you’re going this summer, it’ll be closed for three months – remember that going Northwards is definitely not only quicker but more dramatic, and MUCH more fun!). But we also feasted our eyes on a Golden Eagle who performed just for us, and one night we had a Pine Marten dash across the road in front of us, lit beautifully in the headlights. Fantastic! 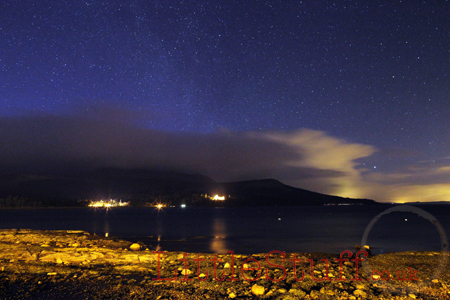 The husband got to practice his night photography too. I’m not sure I’ve ever been a colder, more shivery, teeth-chattering photographer’s assistant before; it was flipping FREEZING on the hilltops after dark. 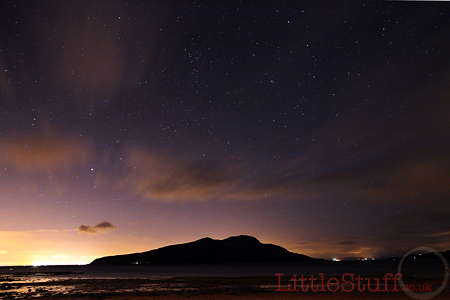 But the night sky over Arran? Wow. That is something to see – absolutely worth every frozen finger and toe. We slept late, we pottered, explored and generally had a marvellous time. The whole week was a quiet reprieve – I’m sure time went slower as we drifted. 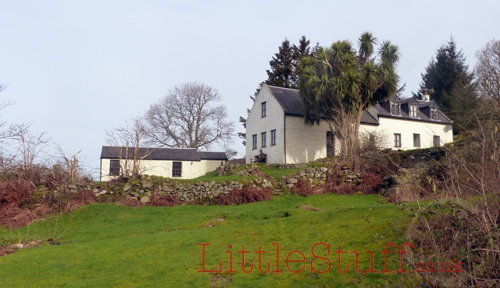 The cottage was comfortable and spacious enough for all of us, and brilliantly equipped. You can always tell when a holiday cottage is the owners own holiday home – it’s full of all the small touches that make it just that little bit more perfect. And Banlicken is an amazing retreat which looked after us perfectly. 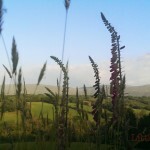 The price for renting Banlicken is £1500 per week in peak season, less obviously at other times of the year. An independent summer of adventure for £50? Hello NCS.